Use DiGize Vitality essential oil to help you enjoy each and every meal! This proprietary blend of Young Living essential oils is a great mealtime companion and addition to your wellness regimen. DiGize™ Vitality™ blends Tarragon, Ginger, Peppermint, Juniper, Fennel, Lemongrass, Anise, and Patchouli essential oils for a fresh-tasting blend—a perfect follow-up to any meal. Some cultures munch on fennel seeds after meals, and the use of this potent plant even dates back to ancient Egypt. Experience the power of Fennel Vitality and these other essential oils for yourself! Take this best-selling essential oil blend with Essentialzymes-4™ or on its own before each meal to support your wellness regimen. 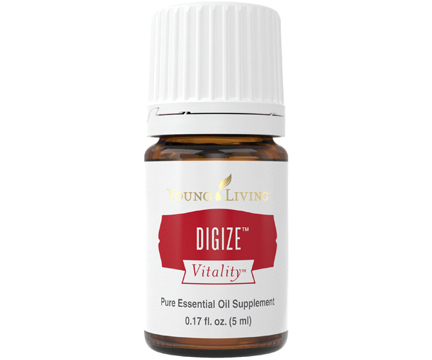 * The versatility of DiGize Vitality oil means that you can take it in a gel capsule, mix it with water and Peppermint Vitality for a rejuvenating infused water, or combine it with honey for a sweet treat. For even more wellness support, take DiGize Vitality with Essentialzymes-4 at breakfast, lunch, and dinner for all-day support. DiGize Vitality is also a great complement to our supplements ComforTone® and JuvaTone®. Our proprietary DiGize Vitality oil blend includes the naturally occurring constituents menthol, citrol, and zingiberene. DiGize Vitality Essential Oil Blend Product Information Page DiGize Vitality Essential Oil Uses: Add 1–2 drops to a gel capsule and take it as a dietary supplement every day—or whenever you need it. Give your water a twist and add 2 drops of DiGize Vitality and 1 drop of Peppermint Vitality. DiGize Vitality is a great complement to Essentialzymes-4. Take both before every meal to support your wellness. * Flavor honey with 2–3 drops of DiGize Vitality for a sweet, spicy treat without the refined sugar. Take with ComforTone and JuvaTone in whatever form you prefer. *These statements have not been evaluated by the Food and Drug Administration. This product is not intended to diagnose, treat, cure or prevent any disease.